Social Arithmetic is amazingly trivial! The basic model has only one parameter and three variables. (a) if ANY of the multiples/factors is equal to ZERO the whole product is ZERO. (b) if ANY (or two, or all three) of the multiples/factors is negative the whole product is negative. If CSI >> 0 the society is on the progressive path. If CSI ~ 0 the society is in the turmoil, social incoherence, revolution-type situation. If CSI << 0 the society is on the regressive path, degrades, in a social decline. In 2016 in America CSI was slightly negative. In 2018 in America CSI is close to ZERO. P.S. my shortest post so far; demonstrates the role of mathematics! Disclaimer: due to its extensive length (102 tweets) this article may be boring. Foreword: Every society has times when people have to stand up for things they believe in. For America this time is NOW (again). Hope: Do not judge a book by its cover, do not judge a piece by its title. There were three main reasons for me to move from Russia in the US. 2. The rule of the law. The prosperity of America is based on the three pillars: (a) checks and balances in politics and governing; (b) preserved by the free speech, and (c) enacted by the rule of law. Break any one of them and the whole society will collapse. 3. America does not have a military draft. When I was a young father I personally knew a young guy (who BTW was a son of a top manager well-known in the city) who did not return home from the Russian army after he was drafted for a one-year term. The story was very sad and stupid. His feet got hurting. He went to an army doctor. The doctor gave him some ointment. Some days later turned out it was a gangrene, but the sepsis was so deep it was too late to save his life. So, I definitely would do everything I could to prevent my son from this fate. Hence, when I had a chance to move to the US, I took that chance. I was at the top of my professional career and had pretty good chances to move up the professional ladder even higher, say Moscow, (TeachOlogy.xyz/vv.htm), but I dropped everything and became a janitor at a Shaw’s supermarket (at first; GoMars.xyz/vvli.html). I saved my son (the two first reasons came like "collateral benefit"). And I believe that the level of my personal and professional achievement allows me to talk openly about actions of others. Time is changing. If the draft in the US does not seem coming back any soon, free speech and the rule of law are at a huge risk to be purposefully destroyed (I have seen how this was successfully done after the Perestroika, simply because people were hungry). And I don’t mean “deteriorated”, diminished”, “weekend”, I do mean “destroyed”, because there is a social force which is actively engaged in the planning and executing actions with the goal of destroying free speech and the rule of law in America. The obvious leader of this social force is the current American President Donald J. Trump. But he represents just a tip of the iceberg. He just rides the wave of racism, misogyny and bigotry which have been brewing for quite some time and now is flashing over the Country. Millions of Americans support Donald Trump in his endeavor to destroy the free speech and the rule of law. We need to keep in mind, though, the difference between people who voted for Donald Trump and people who support Donald Trump. There is a large overlapping between those two groups, but they are not completely identical. Some of the people who voted for Trump did it despite his obvious racism, misogyny and bigotry. For the long period of time they have been seeing the gradual decline in their wellbeing, financial and professional life, and wanted that to change (at least for their kids). But they could not associate any change with Hillary Clinton, at least not for them. Hillary Clinton was a status quo candidate, the establishment candidate, and for millions of Americans who could not promise any more to their children the life better than their own, Hillary Clinton's presidency would not offer any change (when I was an active blogger on the matter, I posted “Why did Hillary Clinton Lost the Race?”, among many other posts on the issue). However, there are Trump supporters, i.e. people who voted for him not despite, but precisely because he is a racist, a misogynist, and a bigot. And the name for them is Legion (here an old Russian proverb comes to mind: if you look into a mirror and don’t like what you see, don’t blame the mirror!). Of course, Donald Trump is not the only rich or poor American who is trying to convert the country from a democracy into an autocracy or oligarchy. The natural question, of course, is – why? The true answer is simple – for white male Americans it is the ONLY way to hold onto their power in the face of the upcoming drastic changes in the American demographics. “EVERYTHING what "conservatives" do, they do it because of one single reason (so, just ignore anything else they say). They do it because of fear. Lately, various late night talk show TV personalities confirmed my statement (for example, watch Bill Maher or read Bill Maher’s “The New Rules” from August 3). And by the way, many so-called liberals are quiet and dormant because they would also prefer to postpone the day when white Americans will become the ethnic minority (this statement so far has not been broadcasted, I am the only person who has strength to openly make it). This is one of the answers to a regular Bill Maher’s question – why do so few liberals go to a voting booth? This is also the reaction of white liberals the Republican puppet masters count on in their pursuit of their happiness. Before talking specifically about the Republicans/Conservatives, or Democrats/Liberals, I would like to make one general note. There is simply no country in the whole world which would be governed directly by the people. Direct governing would be possible only in a very small country where all citizens could gather around at the same time in the same place. It also may become possible in the future when everyone will be able to vote with just a push of a button on a phone. But until then every country in the world is ruled by its elite. The only difference between different countries and political regimes is who and how can become a member of the elite. For example, if the place in the elite is based on the blood line, the governing type is a monarchy; but if the place in the elite is based on blind loyalty to the leader and decided strictly by the leader – we have a dictatorship (or a mafia). A democracy is based on the governing through elective representatives. The notion of a governing by elite should not be foreign to anyone, even the folk wisdom says that “a fish rots from the head down”., so, people know how the governing happens. Governing means managing, and managing is a function of a specific organ. In a body that organ is not a hart, not a liver, etc, in a body that organ is a brain: a body with a weakened brain cannot sufficiently manage its own living. In a society such organ is elite. American elite has been gradually degrading. One of the signs of a degrading management (on all levels) is the fact that for a long period of time the quality of many products and services has also been in a decline. When a country is spinning into a social or economic decline, it happens because the elite lost its touch with the reality and could not make adequate decisions anymore. This may happen due to various reasons: deliberately limit all communication only with people who agree, became lazy, arrogant, overconfident, rigid, overdosed. For example, there is an opinion that the demise of the Roman empire was in part accelerated by the fact that many rich Roman citizens used water delivered via lead aqueducts. America has been known in the world as the beacon of democracy executed via free elections. But the human history knows countries in which elections only look like such (I had been participating in such fake elections). So, the fact that people go to a voting booth and drop a ballot does not necessarily mean that democracy has been served. A lot depends on many other factors, including the average level of education of the voters, opinion influence via mass media, cultural traditions, and more. Classification and assessment of a governing type is very subjective; for example, there is an opinion that the United States of America is not an actual democracy, but a financial oligarchy. Whether it is true or not, America, like all other countries, is ruled by its own American elite, and as the matter of an oblivious fact, since the inception of America, that elite has been vastly/mostly represented by white males. Any significant social and economic changes in the fabric of the American society is eventually rooted in the actions (or inactions) of the White Male American Elite. It this piece, I want to describe several specific examples demonstrating that for the last 30 years the white mail American elite – or WMAE (which probably does not exceed 1 to 3 percent of the whole population) - has been gradually degrading. Simply saying, WMAE has become much more stupid and idiotic than it is required to provide an efficient and adequate governing of the Country. I want to stress that terms “stupid” and “idiotic” do not have any offensive meaning, but used in their clinical/original sense. “Stupidity” means an inability to think. “Idiocy” means a refusal to think. Thinking is a mental process requiring the host to be able to manage and navigate his/her thoughts in a specific direction. In order to enact thinking, the host needs to be aware of the broad context, of the informational landscape, of the map (so to speak) of the relevant knowledge, and also has to be able to operate with a large set of mental entities ("juggling several mental balls at the same time"). This ability can be blocked or severely diminished due to various reasons, for example, due to genetic deficiencies or due to the absence of the relevant practice (two of the most common reasons for stupidity). However, thinking ability also can be blocked or severely diminished due to psychological reasons such as arrogance, or overconfidence (“If it is not my idea, it is a wrong idea”; “I have been doing this since you were little, who are you to tell me what to do”, etc.). One special thinking blockage comes from the fascination by the money (“If you are so smart why aren’t you rich?”) or status (“If I am the boss, I am smart and you are dumb, if you are the boss, you are smart and I am dumb”). People refuse to see that there is no correlation between intelligence and social success; if it was, Albert Einstein would have been the richest person of all time. One may say that I call people “stupid” or “idiotic” simply because they do not share my logic. That is not the case, though. I have no goal to teach the Republicans or the Democrats what to do. My goal is simply to demonstrate that what they do contradicts the goals they claim they want to achieve, that their own actions lead to the results opposite to the goals they declare, and that they refuse to even consider this as an option, and that is what is called stupid or idiotic. 1. My first point is about both, the Republicans and the Democrats. Here and below it is to be assumed that when I write “the Republicans” or “the Democrats” I only mean the top members of the parties, and their top donors, what is called “an elite” (again, probably about 1 to 3 percent of the American population). In order to govern efficiently and adequately, a ruling elite (a stratum, a class, a group) needs to have a certain number of representatives who are smart and knowledgeable and capable of thinking, capable of conducting a complicated logical analysis based on a vast amount of information, and capable of making difficult decisions (the rule of thumb says that this group should comprise al least about 80 % of the elite). When the percentage of stupid or idiotic people in the elite rises, and crosses some critical level, the elite cannot provide anymore an efficient governing and becomes at risk of being replaced. Historically, the process of elite degradation leads to a social and/or economic spiraling down, unrest, chaos, which, since it is coupled with more bad decisions, leads to more chaos, and more bad decisions, and may lead to a social implosion or explosion (a.k.a. a revolution). One of the most serious problems of WMAE is their religious belief into American exceptionalism. It is one thing to inspire citizens by uplifting slogans; that is a strong propaganda point used by all governments in all countries. But it is absolutely another thing to be delusional about the actual state of political and economical affairs, to ignore the laws of history and to assume that a country can be singled out from the forces of those laws, that a country can be above the laws which govern social and economic changes. And that is exactly what the majority of WMAE believes. And that is why their actions contradict their goal – which is the prosperity of American society. It should be noted, that different parts of the elite may have different views on what “the prosperity of American society” means. However, the growing gap between their views and the view of the majority of the citizens is one of the reasons the elite is becoming obsolete; and inability to recognize this growing gap, and the stubborn clinging on the outdated views is another reason why the elite is becoming obsolete. There is a legal principle which says that unawareness about a law does not exclude from the requirement for following that law, and does not excuse breaking the law. This principle, though, is just a copy of the governing scientific principle in physics, or any other science. One cannot break a law of nature. One can try, but one will be punished by the nature (sometime by the death). Laws only can be discovered, described and applied. Everyone who thinks differently should take an airplane built on the assumption that the acceleration due to the Earth’s gravity is 10 m/s2 (or 30 ft/s2), because round numbers are simpler to use (check this link about the Indiana PI bill, it is hilarious!). WMAE simply does not believe in the existence of the laws which govern human history. That is why WMAE is wasting the precious time on reinventing a wheel, or even refusing to accept that they need a "wheel". As a person of science, I always analyze a phenomenon by developing a simple model which would grasp the essence of the phenomenon. The simplest model (but, naturally, wrong in many other ways) of social changes has been offered by Karl Marx. Nowadays, we could paraphrase his approach by saying, that the reason for a social change is a large and growing disconnect between the way wealth is being created and the way wealth is being distributed. For example, in the last 30 years the large portion of wealth creation has been shifted from manufacturing to financial manipulations (this is not the only shift, but one of the most visible). However, the structure of the wealth distribution has not changed (only a very limited number of people can participate in this type of wealth creation), and as the result of that, a vast portion of newly created wealth has been funneling to a tiny percentage of a population. When all gains go only to the top, but all the losses are spread over the working folks, no worker will really care about fundamental economic fixtures. Instead workers will be looking for the "Savior", a.k.a. Trump (and someone needs to tell this to the Democrats). Infamous “income inequality” is not the actual problem, the actual problem is income insufficiency, i.e. when a large portion of a population is poor and - which is much more important - has no real opportunity to change it. For the Republicans, true people are only those who look and think like them. The Republicans base their policies on the assumption that most people (not them, though) are lazy and stupid and need to be guided through life by a strong shepherd. But the Democrats cannot offer anything better because they simply don’t have any philosophy about human behavior except “people are nice”. Hence, the only idea the Democrats came up with is "redistribution of wealth via taxation". But the majority of big donors of the Democrats do not feel good about redistribution of wealth. Money talks louder than the ideals, especially if those ideals are very vague, not specific. When one cell in a body “decides” that it is the most important one and starts converting all other cells into itself (“Agent Smith” in “The Matrix Revolutions”), the body eventually dies, and we call it “cancer”. Financial manipulations have become such a social cancer, which – if not cured or at least contained – will eventually lead to a social death of the Country. For a physicist, a social change is just an example of a phase transition. It happens when one stable phase (e.g. ice) is replaced by another stable phase (e.g. water), but in between there is state with a chaotic and unpredictable behavior (e.g. a mixture of ice and water). In physics there are models which could help understand this type of a transition in any area, including social. In sociology that state with a chaotic and unpredictable behavior is called a revolution (which can be bloody, or soft). A social revolution is always accompanied by the process of an elite replacement, i.e. when one dominant elite is gradually (or drastically) replaced by a new elite (some smart representatives of the outgoing elite can be accepted as partners into a new upcoming elite, if they are able to detach themselves from outdated views and principles). The roots of American exceptionalism are very simple – for a long period of time America has been occupying an exceptional place among all other countries. However, an honest historical analysis demonstrates that American influence in the world has significantly grow after the WWII. In 1945 there was only one major country in the whole world which economy was not just spared from devastation, but had significantly grown. Europe, Russia, Japan were in ruins. Losses America had during WWII were much smaller than the losses of other countries. America had so much economic power, it was like racing a marathon when everyone had to start from the start line but one runner started one mile before the finish line. For decades, using its enormous economic power America has been able to attract the best and brightest minds from all over the world. Clearly, the world is very different today than it was about 70 or even 30 years ago (the "runners" are not so far from each other anymore). But WMAE does not want to accept this change as a fact. Hence, all decisions WMAE makes are based on the models which do not describe the current state of the world. Hence, the results from those decisions will contradict the original goals those decisions had been made for. 2. The Republicans wage a war on public education. I will return to this issue later. Here I want to point at the fact that the Democrats have no idea what to do about public education. They say they want to lift it up, to bring it to the much higher level, but everything they have been trying to do for the last 30 years has not made any significant difference. That is not a problem per se. The problem is that the Democrats refuse to accept the fact that what they do does not work. Hence, they are bound to remain being “insane” (in accordance with the Albert Einstein’s definition). One of the reasons, though, that the Democrats do not make any progress in public education is that they do not really want to have that progress, they are much more interested in fighting the fight than in winning it (keeps them relevant). For decades they have been stuck it the useless confrontation between charters and regular public schools, between merit pay and unions. It is like a ship is sinking because it has thousand holes, and there are only ten pegs, and instead of making more pegs (i.e. preparing more good teachers) the crew is just fighting for those ten pegs, or for what color they should be painted, or how to accessorize them. If the solution could be found within this framework, it would have been found a long time ago. Unfortunately, America does not have a strong social force which would fight for the highest possible quality of public education for all. Political events of the last couple of years have clearly proved that the Democrats badly need a massive population of an educated people. However, instead of approaching the problem as a whole the Democrats (including their donors) got bogged down into myriads of their small pet projects scattered around the Country. This type of heavy self-involvement, narcissism, inability to see a bigger picture is a clear sign of an intellectual degradation. 3. The Republicans wage a war on public education. The reason for this war is obvious for anyone who wants to see – race. It is not a secret that the vast majority of failing public schools is located in the district with the predominantly minority (for now) population. My point is not that this is bad (this is!). But in this piece, I am saying that this policy is bad for the Republicans. And they are just not smart enough to see it. They may accept the fact that the growth of the non-white population is inevitable, unavoidable, and unstoppable. But they decided to focus all they energy on building the political machinery which would exclude the non-white population from political power. In the country with only one political force (Russia, China) that could work. But in America this strategy is bound to eventually fail. It may temporary work (and it has! ), but more and more people finally start seeing the slowly moving anti-democratic coup and begin mobilize against it. Down the road, eventually and inevitably non-white Americans together with anti-conservative white Americans (not from WMAE) will gain the political power strong enough to override whatever barriers the Republicans will be able to build. What the Republicans should start doing for their own sake is makeing sure that people who will eventually come to the power will be educated enough to use that power for the benefits of all, including them, the Republicans. 4. The Republicans wage a war on women, especially on white women. In their “defense”, they do not understand that they do it. Recently we all had another confirmation of how stupid (or idiotic) the Republicans are. It happened when American representatives defended the use of the artificial milk for babies. No sane person would ever agree that an artificial milk is better for infants than the natural mother’s milk. The very goal of the artificial milk was using it when a mother could not produce enough milk for her baby. Then things got out of hands. The result is the rise of allergies, reproductive disorders, immune system deficiencies, and organ damage. But the main point is that the Republicans support measures which defeat one of their own main goals – which is to increase the population of white people. If they would be smart enough they would support every measure other developed countries already have, such as a paid maternity leave, paid kindergarten, etc. Even abortions! The reason the Republicans do not do any of this is because they are afraid of the rise of non-white population who would benefit from all that social support for women. In reality, non-white families do not rely much on that type of support because those families are traditionally large, and family members traditionally support each other. Who would benefit the most from all forms of a women social support is white women! But the Republicans are too stupid or idiotic to see that (again, in the original sense of the words “stupid” and “idiotic”). 5. Denying the existence of a climate change and the human factor in it is just stupid. Making the Earth inhabitable does not help anyone. 6. The political strategy of the Democrats is trivial, outdated, and does not reflect new social fabric of the society. They have no idea about a complicated political machinery. Their strategy is trivial - inventing a new idea and screaming it out loud as loud as possible (but only if that idea does no upset rich donors). A good recent example of this mentality is Chris Hughes, who basically accepted in his book that his best and only life achievement was sharing a room with Mark Zuckerberg. But by some reason he convinced himself that his support for the idea of basic income would make all the difference in the world. A motivational speaker or an educator is not a politician. In order to preserve his legacy as a fair and balanced President Barack Obama removed himself from any party politics. Now, his legacy is Donald Trump. Have you watched “The Manchester by the Sea?” That movie is about Obama leaving the White House. The Republican puppet masters are much smarter on the matter of political machinery than the Democrats. I have many post on the issue and address everyone to this blog: www.the3dforce.us (e.g. “Democratic Party Leaders Have No Vision”, or “What does the Sanders Institute Need to Do?”). This is why I do not believe in the “blue wave” coming any soon. The Democrats are so self-involved (2016 has been erased from the memory as a bad dream), so they would really need another shock to at least start thinking outside of their traditional views. The first step the Democrats need to do is to accept the fact that the Donald Trump’s presidency is mostly their fault! Like in the 12-step program, until one makes the first step, expecting any improvement is just a wishful thinking. BTW: the best thing what the retired President Obama and his foundation can do for the Country now is to initiate and run a deep investigation into why millions Republicans, and them millions of Americans selected voting for Trump over all other candidates. Of course, if he is brave enough to face the results. 6. The Democrats simply do not understand what moves the Republican party and why it is getting closer and closer aligned with Russia. 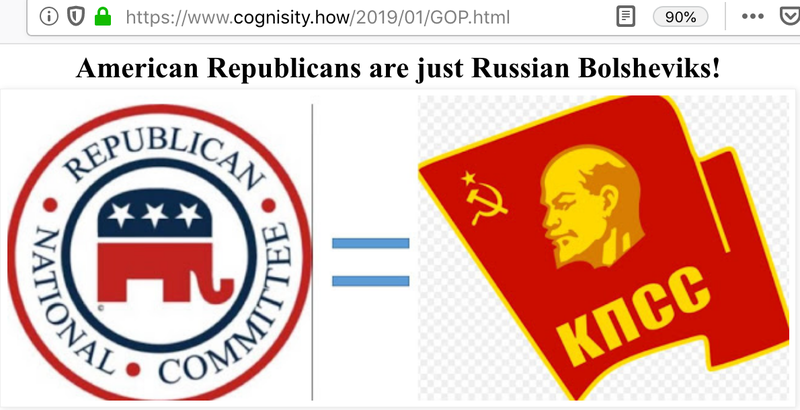 The fact of the matter is that the Republicans are just American Bolsheviks. They do not believe in the rule of law, their motto is “ends justifies the means”. Politics for them is a game where the only goal is to win – no matter at what cost; no one judges the winner; there is only one rule – there are no rules (for them; unless they deal with the leader of the group/tribe!). Lying, deceiving, brainwashing, fact manipulating, destroying reputation, even using force is just the means which can and should be used if the situation calls for that (basically, the mafia mentality). And the Republicans are good at that. But all the Democrats do is they point a finger and scream “look, the Republicans lied again!”; and then the Republicans just shrug and keep lying even more. The behavior the Democrats demonstrate is so pathetic that sometimes I doubt if they are so stupid or idiotic, or maybe it is a purposefully designed strategy used to not upset rich donors. 7. The fight against the border wall clearly demonstrates inability of the Democrats to think. For the Republicans the wall is a strong talking point, a good propaganda piece. Many Americans, especially in rural areas, do not like immigrants and against immigration (illegal and legal). For a long period of time their economic status has been declining and "those damn immigrants" turned out to be a good scapegoat. Of course, immigrants has nothing to do with the economic decline. Of course, the wall will not solve anything. If starting tomorrow no immigrant would enter the Country, that would not stop the inevitable - the demographic switch which will make the whites a minority. Building the wall to curb the demographic rise of minorities is like peeing on sparks falling down from a burning house - "at least I am doing something about it!". For the main goal of the Republicans the wall is useless. But that is exactly why the Democrats have to stop fighting it and need to embrace it, and to use the wall as a bargaining piece. How many billions will it cost? Fine. Go. But in return, we want ten times more in the budget for our programs (immigration reform, healthcare, free colleges, etc. - whatever they want). Even if the wall will be built, it will not affect anything for those rural Americans, hence, it can become a good talking point for the Democrats ("we told you that, remember?"). Plus, the Democrats can bargain that large portion of the jobs on the wall would go to low income Americans. 8. The Russia card is being played by the both parties, and both parties do it in the stupidest way possible. Of course, Russia interfered in 2016! Russia has been interfering, is interfering, and will be interfering. And expecting from Russia something different was and is stupid! BTW: everyone who wants to know, knows that America is also not so innocent (the examples are numerous, e.g. check the "failing" NYT). Well, this time Russia outplayed American forces. Let’s see who will win the next round. What the Democrats need to do is to get in the head of the #1 Russian – Vladimir Putin. Vladimir Putin hates America. He hates America for breaking up the USSR. He believes that without American intrusion that would not happen. And he will do everything he can to get back at America (including the secession of Texas, if possible) – with a smile on his face. So, someone in the US counterintelligence should start thinking like Putin, trying to prevent the next “Russian-lead technological/political/social 9/11” (remember the “failure of imagination”?). Russia is a strong and very resourceful country with a long and difficult history. Russia knew riots and revolutions; wars, starvation and prosperity. Russia won WWII (the allies entered the active war actions in Europe only when they realized that Russia could and would finish Hitler without any help). Russia rebuilt itself after WWII. Russia built an atomic bomb, a hydrogen bomb, sent a cosmonaut into the space. And Russian people know that they can do great and difficult things, hence they are confident they will survive any serious turmoil. Russian people are ready to sacrifice for the greatness of the Country. And also, due to a thousand of years of monarchy, Russian people do not believe in democracy, and in a case of a crisis always seek for a “Good Tsar” to rescue the Country. And the new “Good Tsar” delivered on the promises, and established a stable and relatively good living for many Russians (if there is anything "positive" in a dictatorship it is stability, hence predictability – BTW, one of the reasons why big businesses do not mind dictatorships). Putin knows that eventually he will have to step down. And when that happens he wants to leave Russia in the strongest state possible (that is what differs him from Trump, who only cares about his personal wealth and popularity, and Trump’s enablers, who only care about remaining in power). That is why Putin will never return Crimea to Ukraine. Putin has a very long term strategy (as a part of this strategy he replaced an old ideology with an orthodox religion, so freedom of thinking is not coming to Russia any soon). After Bolshevik's coup in 1917 no country would trade with Russia. But eventually money started to talk; businesses started to deal with Russia. Sooner or later this will happen again. At the worst, current politicians will eventually retire and new ones will not be taking Crimea so deeply to a hart. American Democratic strategists should start learning from Putin, i.e. they should start doing what the title suggests – developing a long-term strategy (not strategery). * Want to make a difference? Be different. * Want to change the world? First, change yourself. There are many signs indicating the degradation of the WMAE in the last 30 years. Theoretically, there is a chance that the people who are currently in the power will be able to bend American democracy and prolong their reign for several more decades (“1984”). If that happens, the American leadership in the world would definitely go to the end (the American decline will inevitably lead to the loss of its great status). But the Republicans and their puppet master do not care about that. Their motto is "Après nous, le déluge". They prefer to rule in a declined America than being removed from power in a strong America. So, there is no doubt in mine mind that the process of the WMAE degradation will continue. The question is – will they drag the whole Country down with them? Once in a while I tell my students my view on something outside of physics. I do not give an advice, I rather offer a question. This is what I said (more or less) after the 2016 election. America is in a very unstable situation. America is at a fork. No one knows what will happen and how it will end (and not just in America, but in the whole world; the phase transition is happening all over the world, and no one knows where will it lead). If you want to make sure that your future, and the future of your family will be bright, you have to be engaged, you have to pay attention to the events. Do not trust anyone, question everyone, think for yourself. If America would become “American Russia” or “Russian America” it would not affect my life at all. I have seen it; I know what it’s like. I could even move back to Russia. It would not make much difference anymore, but I could have a comfortable life using my American dollars, making some extra by teaching English or math and physics in English (as I tell my students, always have a backup plan, and a backup plan for the backup plan). But what would YOU do if that would happen?